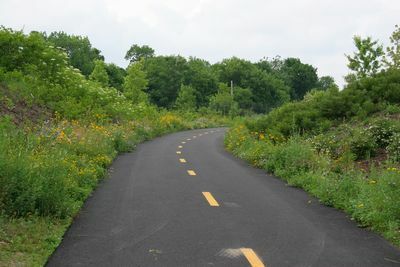 The Blackstone Valley Bike Path begins in Worcester, Massachusetts and goes down through Millbury, Sutton, and ends up continuing through Rhode Island into Providence. This bike path is still being constructed. It's northernmost end, in Worcester, is supposed to end up at a new Tourism Center, which is not yet built. Right now the segment which is done in Massachusetts is about 2 1/2 miles. It starts at the Blackstone Valley Shoppes exit off of Route 146 in Worcester, MA. The parking lot is on the east side of that exit, immediately on the right. The northernmost part of the route is where 146 hits Blackstone River Road. There is NO parking lot there. The only other parking lot on this stretch is on Millbury Street (i.e. the "old Route 146") about halfway along this length. The bike path currently does NOT go south through the rest of Millbury or into Sutton. The "Tricentennial Park of Sutton" should eventually be a part of the bike path, once the money is found to keep paving it. The photos on this entry page were taken by me from the bike path in July 2005. We have been there numerous times since its creation. My friend Debi and I did a walk from the Millbury Mall parking lot up to but not including the center parking lot. We did a lot of "off path" exploring. We saw a beaver, several mallards, some common merganser ducks, and a titmouse. We also got cool photos of River Birch trees. We did a pedometer test walk on this fine day. We started at the Millbury Street parking lot and walked to the Worcester-Millbury line, which is marked by a solid stone line across the bike path. We determined that this distance is exactly 1.2 miles in each direction. These photos go from the Millbury Street parking lot to the Worcester "end" at Blackstone River Road, and back again. They are very detailed to show each part of this walk. This is a 1.62 mile roundtrip walk. 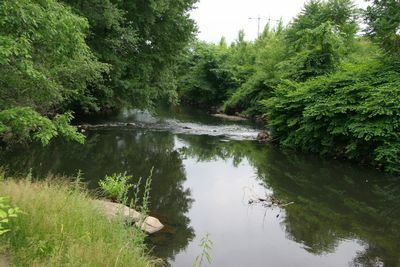 These photos go from the Millbury Street parking lot to the Worcester "end" at Blackstone River Road, and back again. These photos focus on the flowers and natural beauty of the path. This was just after the path stretch here was completed. Rhode Island has a 9 mile segment open of their "half" of the bike path, beginning in Woonsocket RI.